Coming home exhausted from a hard day’s work with hungry, needy, cranky, tired kids is stressful, especially if you’re a single parent. It can be more stressful than your actual workday, and very physically and mentally demanding. 1. Accept the 10-15 minutes of chaos upon arrival at home. Keep cool, give the kids exclusive attention and listen to them intently for 15 minutes. 3. Schedule active playtime for after dinner, when bellies are full, and the pre-dinner chaos is over. If it’s nice out, walk to the park to decompress and play with the kids. Playtime! At least everyone’s fed and in a good mood. 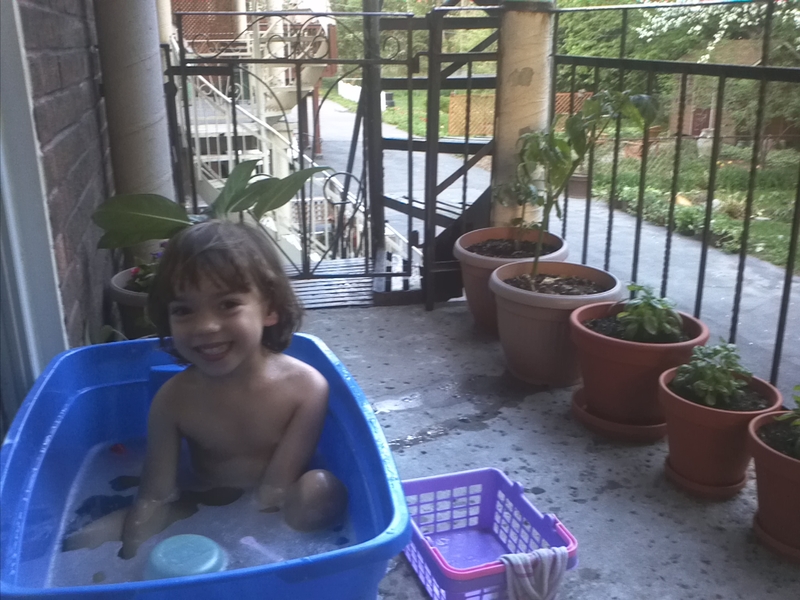 She would only take her bath outside in a big tupperware. 6. Order take-out for dinner once every week or two. 7. Outsource if you can: I pay 60$ every two weeks for a cleaning lady to come while I’m at work. Some of my best money every spent: I don’t have to spend the weekends sweeping, dusting, vacuuming and mopping, and I have more stress-free quality time with my kid. 8. Extracurricular activities that require driving can be reserved for weekends only. Extracurricular activities that take place at school can happen during the workweek. Driving across town in rush hour traffic is an unnecessary stressor! 9. Meditate in the morning for 5-10 minutes. Get used to incorporating 5-10 minutes of meditation in the morning before the craziness of the workday begins. It’s only minutes from your busy day, and has many scientifically proven benefits, including making the day go smoother. 10. Schedule some me time. After the kids are in bed, do something for you: yoga, reading, watching your favourite TV series etc… If you can get a babysitter to come once a week and put the kids to bed while you enjoy a fitness class or activity, do it!